Do you have a horse that is either close to retirement or is already retired? Retiring a horse that you’ve ridden for years is not easy I know I had to do that with my Arabian gelding. With age horses like humans lose their stamina, strength and flexibility. Have you thought about what your horse’s needs will be after retirement? They can easily be injured and don’t handle stress well which could lead to them getting sick easier. If you were active with your horse taking them to competitions such as horse shows, trail rides, parades etc., they were used to a lot of attention. 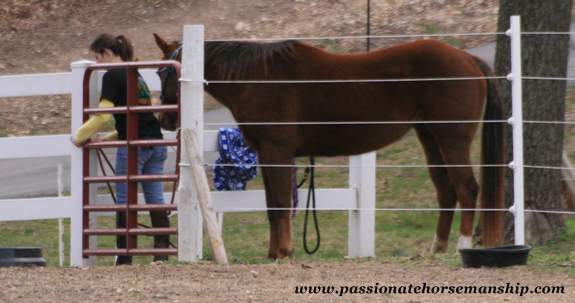 Sometimes when people retire their horse they put them out to pasture and neglect to give them much attention. A retired horse still has emotional needs. Make sure you groom them on a regular basis and spend time with them after all they were your partner for many years. out where they can move around and get some exercise instead of being cooped up in a stall. Horses were designed to move and it keeps them healthier. By being able to move around it helps to keep their digestive system working properly and it helps to wear their hooves. If you have no choice, but to keep them in a stall make sure they can get some sort of low-level of exercise by doing such things as turning them out daily, lunging, hand walking or putting them on a walker. Your horse will still need to have dental care as their teeth will still develop sharp edges which will cause sores in the mouth and could lead to weight loss. It would also be a good idea to have a yearly checkup from your veterinarian to make sure there are no underlying health problems. Some horses as they age will also require more calories. For instance my gelding was losing weight even though he had coastal hay in front of him 24/7. He had been wormed and had his teeth done and it still didn’t help so I gave him a feed with more calories which is helping. You’ll also want to make sure your retired horse doesn’t get overweight. The majority of older horses have arthritis and one that is overweight could have problems with their joints. Just like humans that are overweight they have more problems with their knees, ankles and feet. Retired horses can bring a lot of joy to humans as well as other horses. There are a lot of people out there that would give anything to be able to groom a horse and some would love to have their picture taken with them. They can also make great companions to other horses or foals. If you have a retired horse I would love to hear how you care for your horse and what you do with them. Leave me a comment below.